Below is a list of recent press releases. 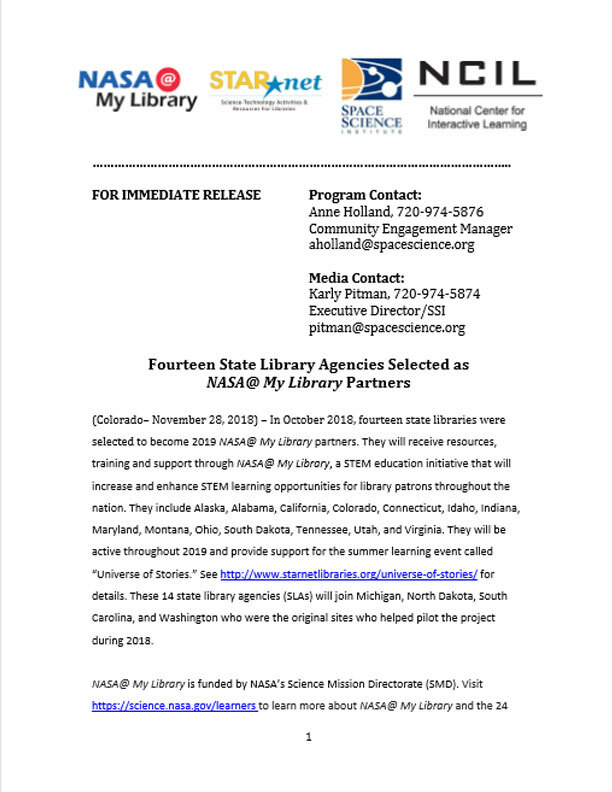 Colorado– November 28, 2018 – In October 2018, fourteen state libraries were selected to become 2019 NASA@ My Library partners. 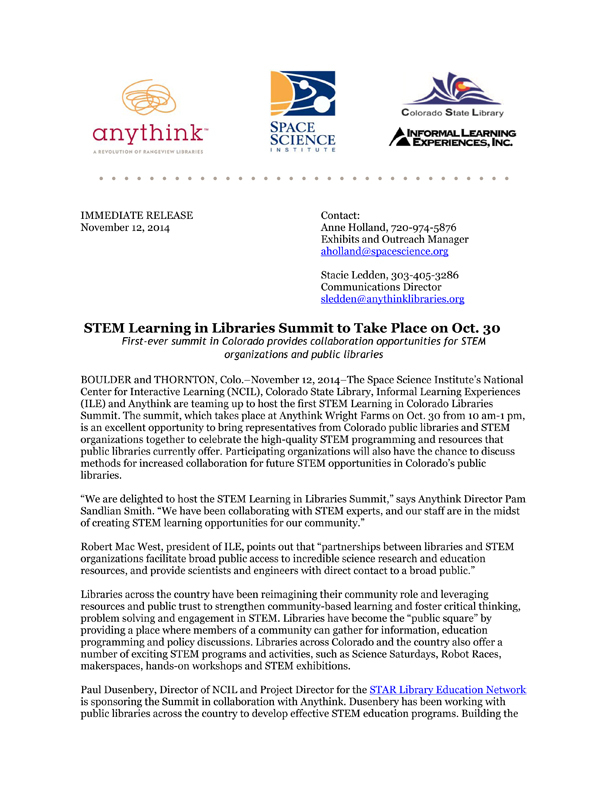 They will receive resources, training and support through NASA@ My Library, a STEM education initiative that will increase and enhance STEM learning opportunities for library patrons throughout the nation. They include Alaska, Alabama, California, Colorado, Connecticut, Idaho, Indiana, Maryland, Montana, Ohio, South Dakota, Tennessee, Utah, and Virginia. 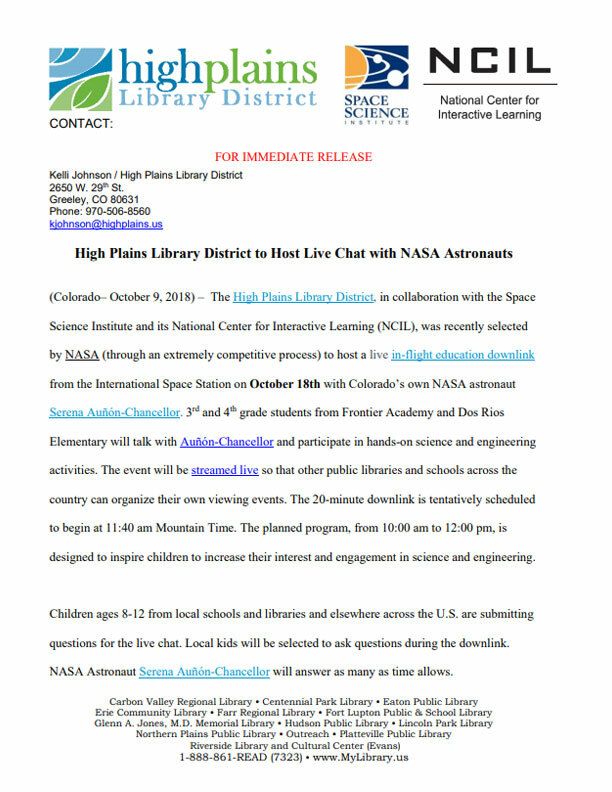 BOULDER, Colo.– October 9, 2018 – The High Plains Library District, in collaboration with the Space Science Institute and its National Center for Interactive Learning (NCIL), was recently selected by NASA (through an extremely competitive process) to host a live in-flight education downlink from the International Space Station on October 18th with Colorado’s own NASA astronaut Serena Auñón-Chancellor. BOULDER, Colo.– September 25, 2017 – 2.1 million pairs of eclipse glasses were distributed free through public libraries in the U.S. for the solar eclipse event on August 21, 2017. 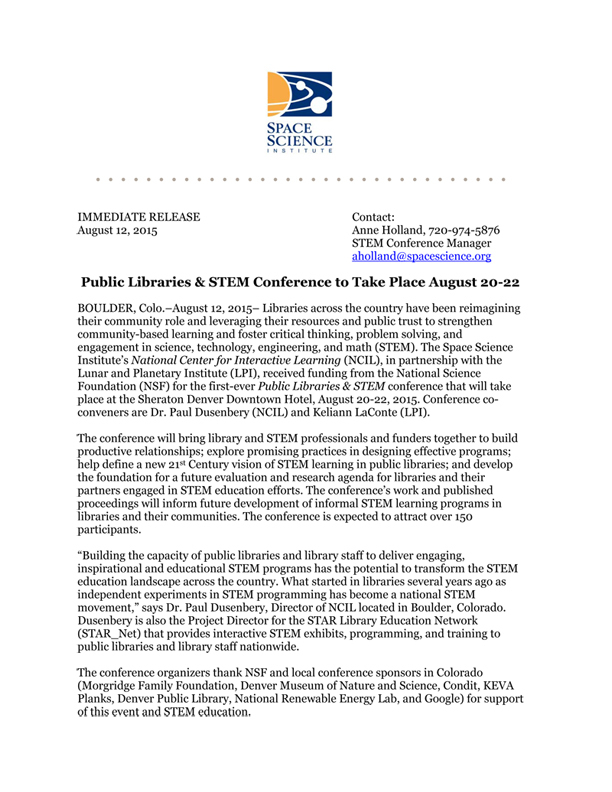 7,100 organizations, including public library branches, bookmobiles, tribal libraries, library consortia, and state libraries, received a package of free safe-viewing glasses, plus a 24-page information booklet on how best to do public outreach programs about the eclipse. 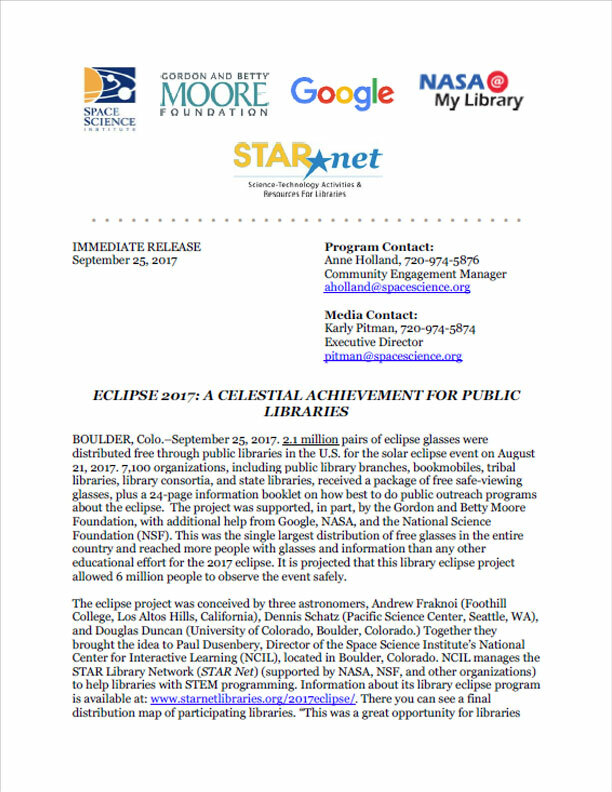 being distributed free through public libraries in the U.S. for the eclipse of the Sun taking place on August 21, 2017. 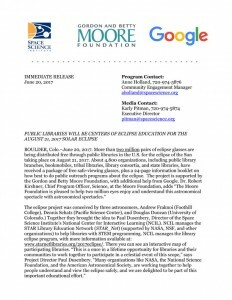 About 4,800 organizations, including public library branches, bookmobiles, tribal libraries, library consortia, and state libraries, have received a package of free safe-viewing glasses, plus a 24-page information booklet on how best to do public outreach programs about the eclipse. 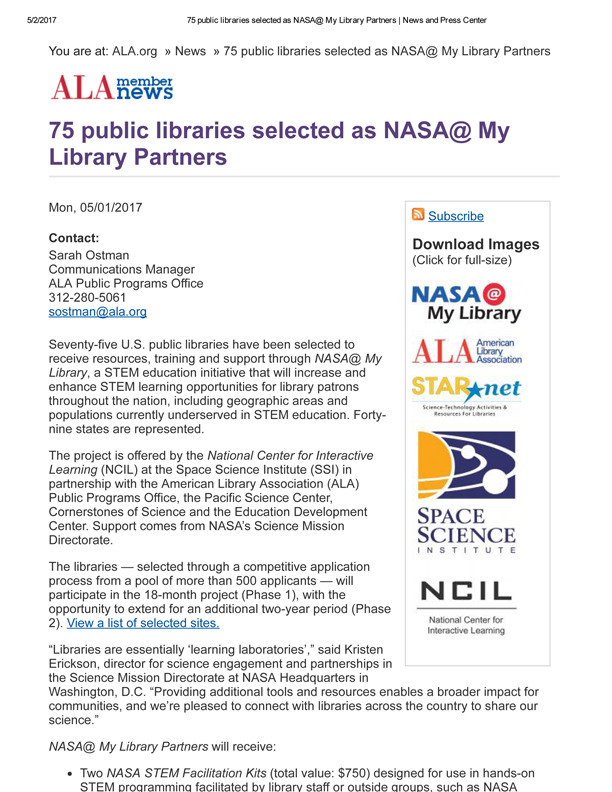 BOULDER, Colo.– June 9, 2017 – Seventy‐five U.S. public libraries have been selected to receive resources, training and support through NASA@ My Library, a STEM education initiative that will increase and enhance STEM learning opportunities for library patrons throughout the nation, including geographic areas and populations currently underserved in STEM education. Forty‐nine states are represented. 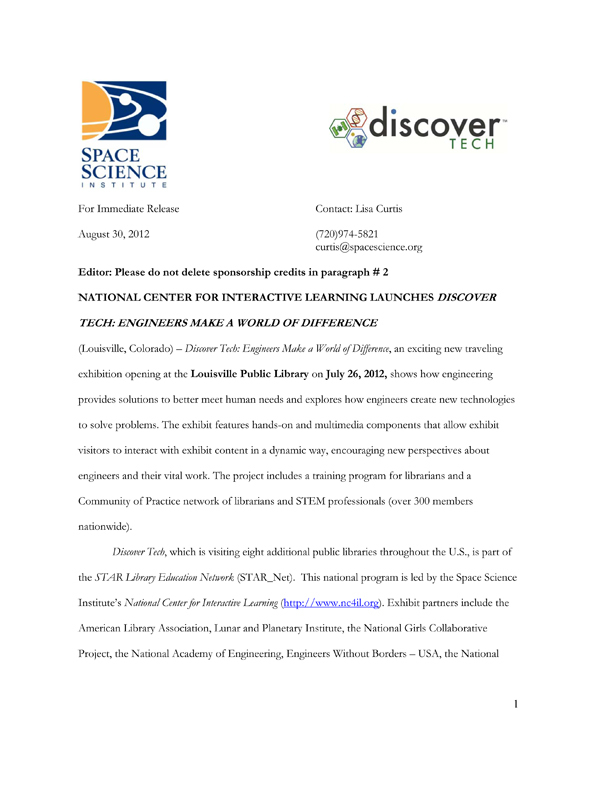 For information about the program visit http://www.starnetlibraries.org/portfolio‐items/nasa‐mylibrary/. 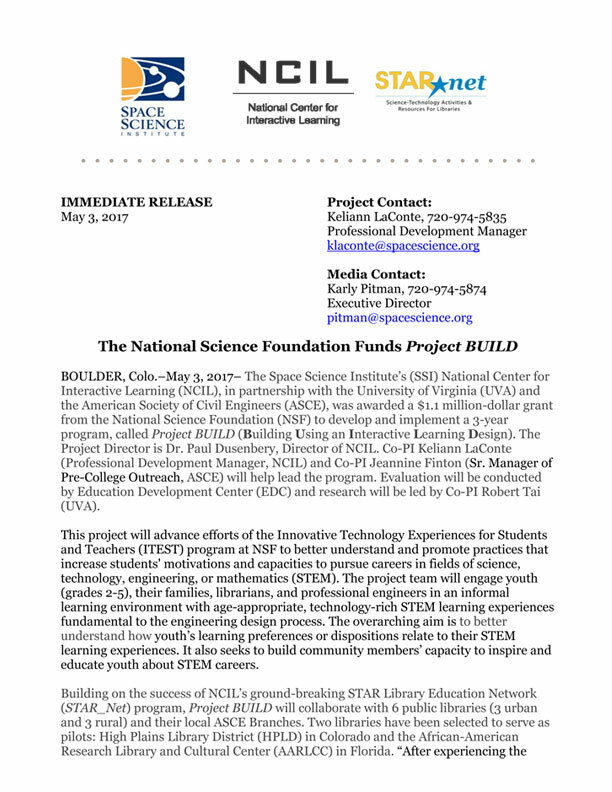 BOULDER, Colo.– May 3, 2017 – The Space Science Institute’s (SSI) National Center for Interactive Learning (NCIL), in partnership with the University of Virginia (UVA) and the American Society of Civil Engineers (ASCE), was awarded a $1.1 million-dollar grant from the National Science Foundation (NSF) to develop and implement a 3-year program, called Project BUILD (Building Using an Interactive Learning Design). The Project Director is Dr. Paul Dusenbery, Director of NCIL. Co-PI Keliann LaConte (Professional Development Manager, NCIL) and Co-PI Jeannine Finton (Sr. Manager of Pre-College Outreach, ASCE) will help lead the program. Evaluation will be conducted by Education Development Center (EDC) and research will be led by Co-PI Robert Tai (UVA). 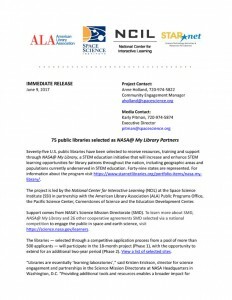 May 1, 2017 – Seventy-five U.S. public libraries have been selected to receive resources, training and support through NASA@ My Library, a STEM education initiative that will increase and enhance STEM learning opportunities for library patrons throughout the nation, including geographic areas and populations currently underserved in STEM education. Forty-nine states are represented. 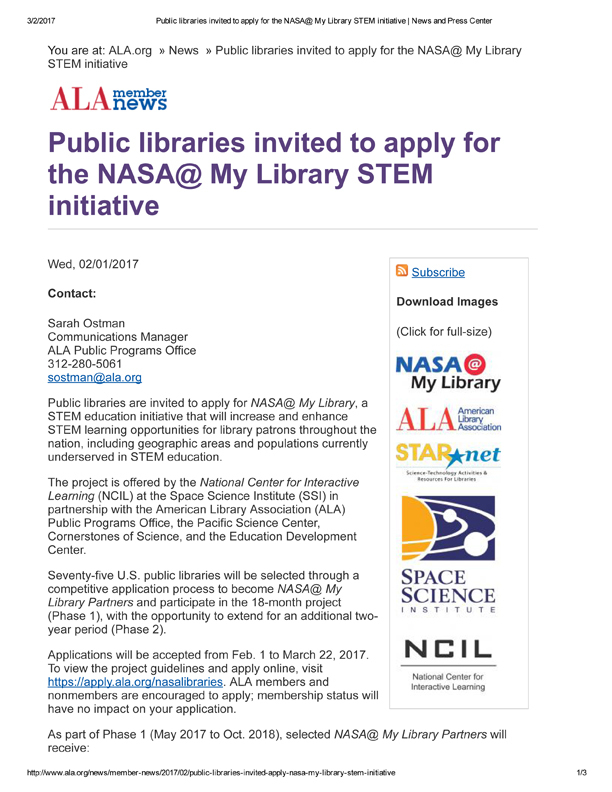 February 1, 2017 – Public libraries are invited to apply for NASA@ My Library, a STEM education initiative that will increase and enhance STEM learning opportunities for library patrons throughout the nation, including geographic areas and populations currently underserved in STEM education. 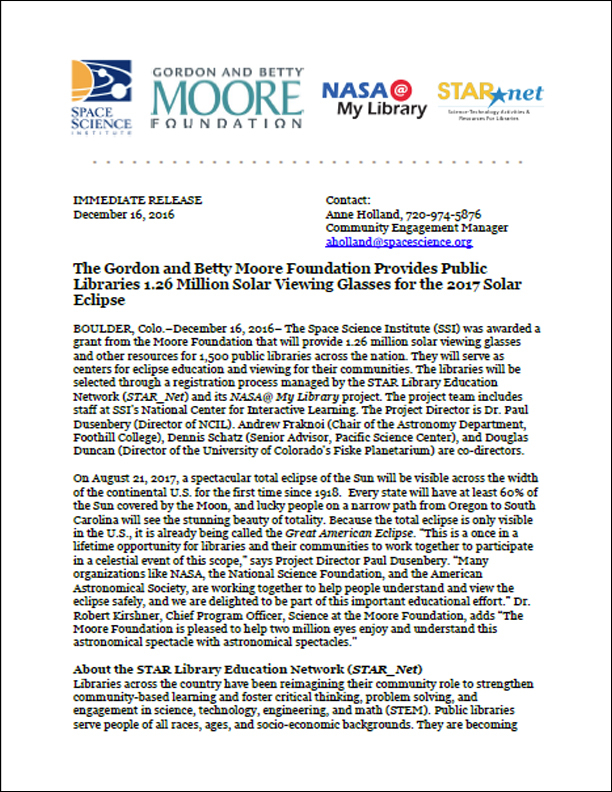 BOULDER, Colo.–December 16, 2016– The Space Science Institute (SSI) was awarded a grant from the Moore Foundation that will provide 1.26 million solar viewing glasses and other resources for 1,500 public libraries across the nation. They will serve as centers for eclipse education and viewing for their communities. 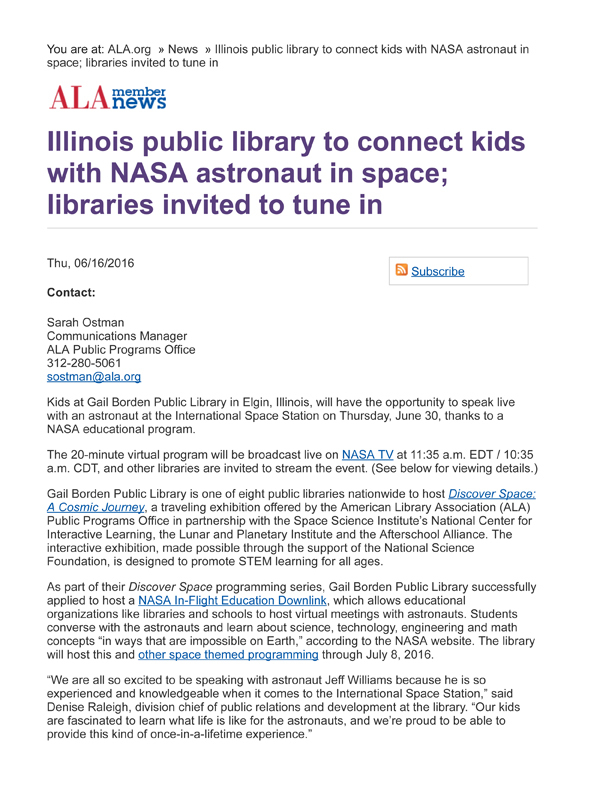 The libraries will be selected through a registration process managed by the STAR Library Education Network (STAR_Net) and its NASA@ My Library project. 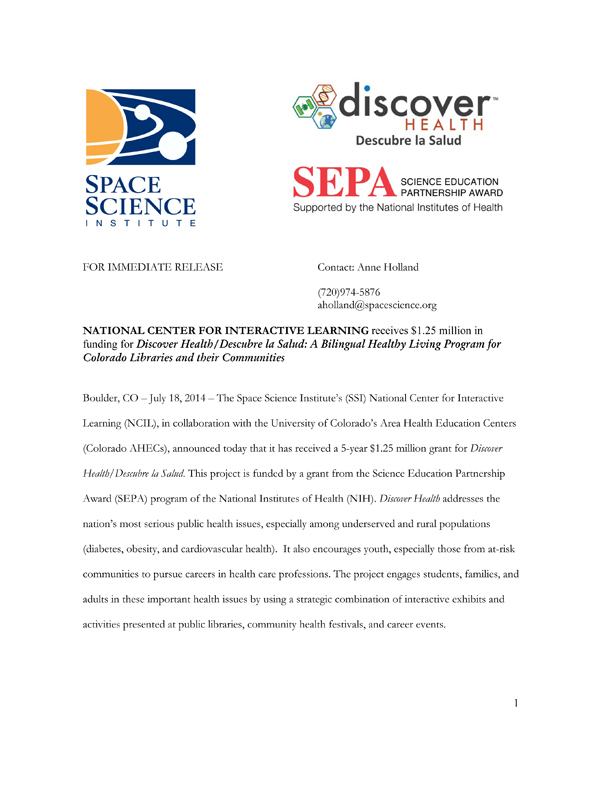 The project team includes staff at SSI’s National Center for Interactive Learning. The Project Director is Dr. Paul Dusenbery (Director of NCIL). 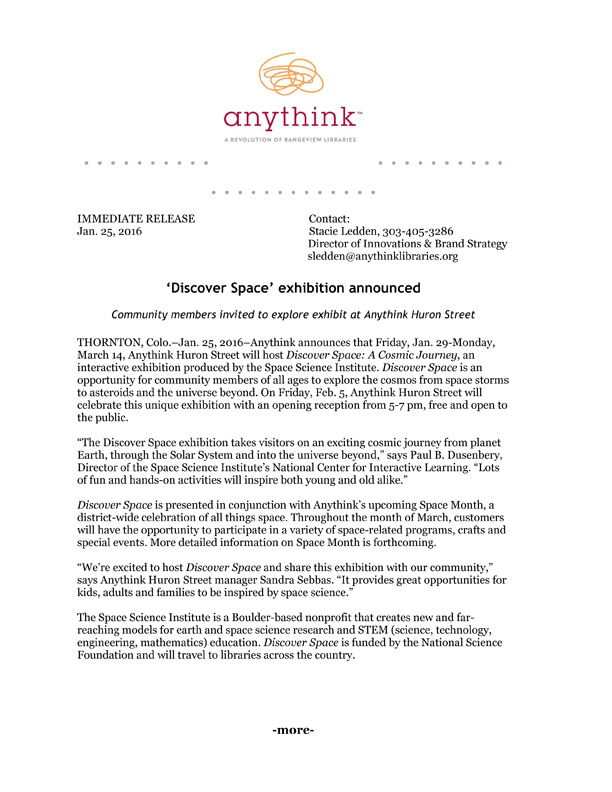 Andrew Fraknoi (Chair of the Astronomy Department, Foothill College), Dennis Schatz (Senior Advisor, Pacific Science Center), and Douglas Duncan (Director of the University of Colorado’s Fiske Planetarium) are co-directors.